Comparison shopping engines are websites that consumers can use to find multiple retailers offering the product they want to buy. They can compare the offering from each of these retailers and select the one that is most appealing. 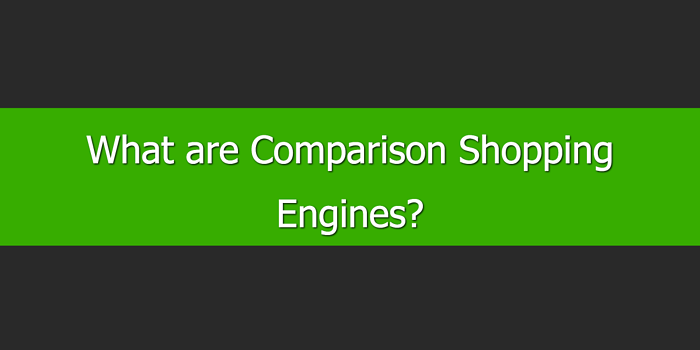 Comparison Shopping Engines (CSE) are also known as price comparison websites. From a retailers’ perspective, comparison shopping engines are a method of online advertising. They allow retailers to upload their product data feeds, set bids for particular products or product categories. The products in the data feed then appear on the comparison shopping engine. This is alongside products from other retailers. When a user clicks on one of your products, they go to your website where they can complete the purchase. Marketplaces, like Amazon and eBay, have things in common with comparison shopping engines. You can list products on marketplaces in a similar way to comparison shopping engines. Also, those products will appear alongside other retailers when consumers browse or search the marketplace. The main difference is how the user makes a purchase. Most comparison shopping engines operate on a cost per click (CPC) basis. With CPC, you don't pay anything unless a user clicks on your product listing to visit your website. This is where they complete the purchase on your website. On a marketplace, the transaction takes place on the marketplace’s website. For example, on Amazon or on eBay. Only at this stage, when making a sale, does the marketplace charge you. This is a cost per acquisition (CPA) model. Wider reach: Comparison shopping engines let you expand your reach beyond your website to find new customers. Improved conversions: A potential customer only clicks to visit your website on a comparison shopping engine after they have seen an image of the product, a price, and other information, including who you are. As consumers are more likely to click on listings they are happy with, you have more chance of getting the conversion. You own the customer: This is a particular advantage of comparison shopping engines over marketplaces. When a customer buys one of your products through a marketplace, like Amazon or eBay, they remain a customer of the marketplace. This makes it impossible for you to engage with them in a meaningful way at a later stage. Or, turn them into a returning customer. However, with a comparison shopping engine the customer is yours. Manage your data feed: Adhering to the channel's feed specifications, optimizing content in the data feed, and ensuring it stays up-to-date, are all crucial to achieving success on comparison shopping engines. DataFeedWatch helps you achieve this. Manage your bids: Ideally, you should do this on a daily basis. It means removing products that do not perform – products that get clicks but no conversions – and increasing bids for products that perform well. Optimize your website: The consumer’s final decision to purchase the product will take place on your website. This means you should optimize your site to ensure you don't lose the sale. This includes having a fast-loading website, an optimized mobile website, an easy to use shopping cart, and a secure checkout process. Providing you take the steps above, you will generate profitable returns from comparison shopping engines. This makes them an essential part of the customer acquisition strategy.